Recently his Airness also known as one of the greatest basketball players of all time, Michael Jordan has released the third colorway of the Jordan XX3. These awesome sneakers were recently released April 5, 2008. Celebrate 23 years of Jordan greatness with the ultimate basketball shoe for the greatest players. The Air Jordan XX3 basketball shoe features a style unlike anything you’ve ever seen before: a construction made without the use of any glue — the first of its kind for a performance basketball shoe. The upper of this Jordan basketball shoe is a combination of rich leathers and supple synthetics that come together to offer one of the most sustainable basketball shoes ever created. A timeless sense of style and precise stitching combines with an engineered perforation pattern to offer superior breathable performance. Quilted foams and linings offer excellent protection and comfort. The midsole is full-length Phylon™ surrounded by a plated chassis, which houses Zoom Air™ cushioning. 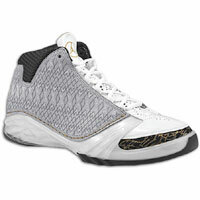 This basketball shoe offers great comfort and protection while maintaining stability. The solid rubber outsole features a multidirectional pattern that is inspired by Michael Jordan’s thumbprint. The traction pattern enhances stability and grips the court for quick cuts that will be envied by your opponent.